Rescue efforts are continuing after Monday's powerful earthquake in the central Philippines that left dozens of people dead or missing. Army teams were carrying out search operations, said Ver Neil Balaba, operations officer at the regional Office of Civil Defence, and police had been deployed to prevent looting. "The most urgent needs now are water, tents and food," he said. 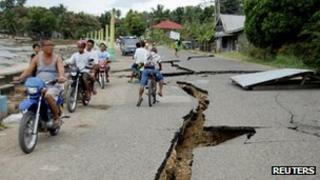 The quake hit 70km (45 miles) north of Dumaguete city on Negros island. The 6.7 magnitude earthquake struck at 11:49 (03:49 GMT) at a depth of 20km, according to the US Geological Survey. At 17:00 local time, the Office of Civil Defence put the number of dead at 21 people, with 71 others reported missing and 52 injured. The death toll includes two children, according to the government's National Disaster Risk Reduction and Management Council. One local report on Monday put the number of dead at 43, including many people killed in a landslide in the badly-hit coastal area of Guihulngan. But this report has not yet been confirmed by the central authorities. Telecommunications have been cut in many areas. A series of aftershocks followed the initial quake, one of them registered a magnitude of 6.2 at the epicentre. The Philippine Institute of Volcanology and Seismology issued a tsunami alert for the area, but had lifted it by 14:30. On Tuesday, public schools and two universities in Negros Oriental province were closed. Regional officials and an administrator from Manila had also arrived in the area and were assessing damage and needs, said Mr Balaba, who is based in Cebu. Damaged roads and bridges added to challenges faced by rescue workers and the transport of aid and supplies. In the town of Guihulngan, about 90km north of Dumaguete, reports said some houses had been completely buried by landslides, and the market and court house were also damaged. The town's 42-strong police force, joined by army personnel and volunteers, had been searching for survivors and clearing debris, said Inspector Alvin Futalan, police chief of Guihulngan. "The army (troops) had to walk about 50km from the last stop reachable by vehicle to reach us," he told the Agence France Presse news agency. Nine bridges were damaged in Negros Oriental, with four no longer passable, said Governor Roel Degamo. The quake also caused a landslide in the mountain village of Solongon in La Libertad town, in the same province. "We're now getting shovels and chain saws to start a rescue because there were people trapped inside. Some of them were yelling for help earlier," La Libertad police chief inspector Eric Arrol Besario told the Associated Press by phone.